Healing literally means to make whole and can be either the physical or the psychological aspects of health for humans or animals. Within the new age movement, healing usually refers to various methods of alternative or complementary medicine to correct any imbalance and enable people to lead a normal life without being overwhelmed by any ailment. This is commonly referred to as holistic health a concept that includes all aspects of a person’s well-being including their psychological, physical, social, environmental, and spiritual needs being taken into account and seen as a whole rather than one factor being considered in isolation. This is where it gets a bit confusing as use of this term is used to describe many forms of alternative or complementary medicine based upon the concept of healing of the spiritual rather than the physical body although the two are one of the same. Spiritual healing is a term that is also used to describe the healing energies that come from spirit or God that pass through the healer or that the healers hand are directed to affected parts of the body hence the term healing hands. This practice, sometimes known as faith healing, is not dependent upon any religion, as the concept of God is applicable to many different faiths. However, some believe that it is faith in the healer rather than a divine spirit that is at work in which case there is no need for any religious belief what so ever. An explanation for any positive results can be explained by the placebo effect and the body’s natural healing abilities. In any context spiritual healing is not an alternative to, nor should it be used to delay seeking conventional medical treatment, moreover, any suggestion to this effect is irresponsible and dangerous. It has no basis in medicine or science and practitioners cannot claim to have a cure for anything. It can however, be used to complement conventional medicine as therapy to induce a positive frame of mind, which many doctors believe is essential to help combat any ailment or aid recovery. It also fills the gap that many doctors are unable to fill with regard to counselling of their patients circumstances. Many forms of alternative medicine such as Reiki and Colour Therapy are based upon balancing the human energy system, which is comprised of the aura and associated chakras that can explain the cause of many psychosomatic illnesses. An aura is an envelope of vital energy, which radiates from everything in nature including minerals, plants, animals and humans. The aura is not visible to normal vision, but may be seen by a psychic or empath who can feel its vibrations, it can also be photographed using specialised photographic technique known as Kirlian photography. The aura is often described as a multi coloured mist that has an assortment of boundaries and properties. The aura binds our physical bodies to our spirituality; it is not in any way separate from our physical body but they combine as one unit that makes up the whole person. The aura acts as a prism to divide white light into its component colours that are sent to different coloured layers around our bodies. These auric layers correspond to chakras or energy centres which in turn relate to major organs in our bodies. The aura is the way in which these chakras are energised and are the means by which we communicate with our aura and vice-versa. This means we need a balance of all the colours in white light to remain healthy, an imbalance can affect our psychological well-being and cause physical illness. The Chakras or Energy Centres. The chakra is like a vortex, its function is to pump and regulate the flow of energy through our energy system. Our chakras respond to the decisions we make concerning the difficulties and conditions in our life, we open and close these valves when we decide what to think, and what to feel, and through which we perceptually filter to experience the world around us. 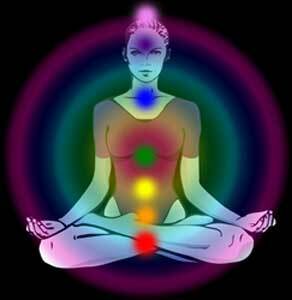 The chakras are more dense than the auras, but not as dense as the physical body. The chakras interact with the physical body through two major vehicles, the endocrine system and the nervous system. Each of the chakras is associated with the endocrine system and various parts and functions of the body. All of your senses, all of your perceptions, all of your possible states of awareness, everything it is possible for you to experience, can be associated with a particular chakra. Thus, the chakras represent not only particular parts of your physical body, but also particular parts of your consciousness. When you feel tension in your consciousness, you feel it in the chakra associated with that part of your consciousness experiencing the stress, and in the parts of the physical body associated with that chakra. Where you feel the stress depends upon why you feel the stress! The tension in the chakra is detected and transmitted to the parts of the body, when the tension continues over a period, or to a particular level of intensity, the person creates a symptom on the physical level known as a dis-ease. Symptoms serve to communicate to the person through their body what they had been doing to themselves in their consciousness. When the person changes something about their way of being and is no longer getting the message communicated by the symptom, the symptom has no further reason for being, it can be released and the dis-ease goes away. Understanding the chakras allows you to understand the relationship between your consciousness and your body that in turn gives you a better understanding of yourself and the world around you. Some people believe there is a connection between spiritual healing and karma that something in our past or past lives has come back to manifest itself in the form of an illness. This entry was posted in Featured Posts and tagged alternative medicine, consciousness, counselling, doctors, healing, karma, new age, religion, science, stress. Bookmark the permalink.